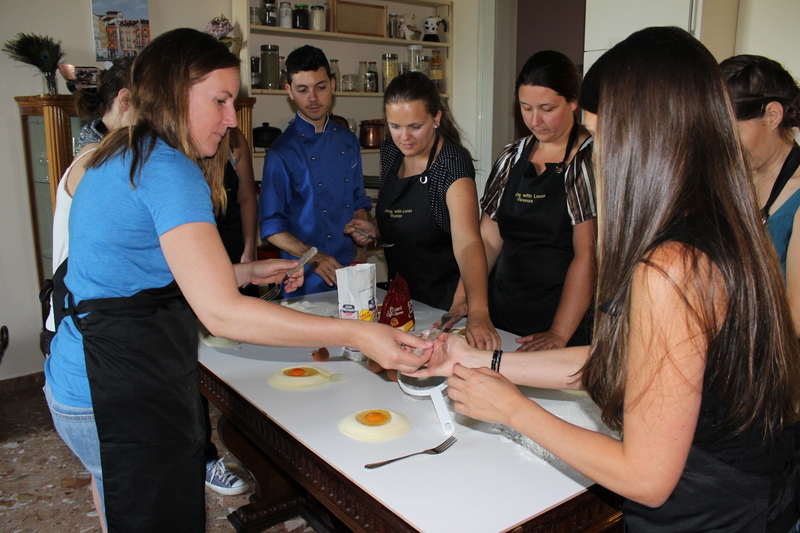 Yesterday I took my first cooking class with Cooking with Lucas. 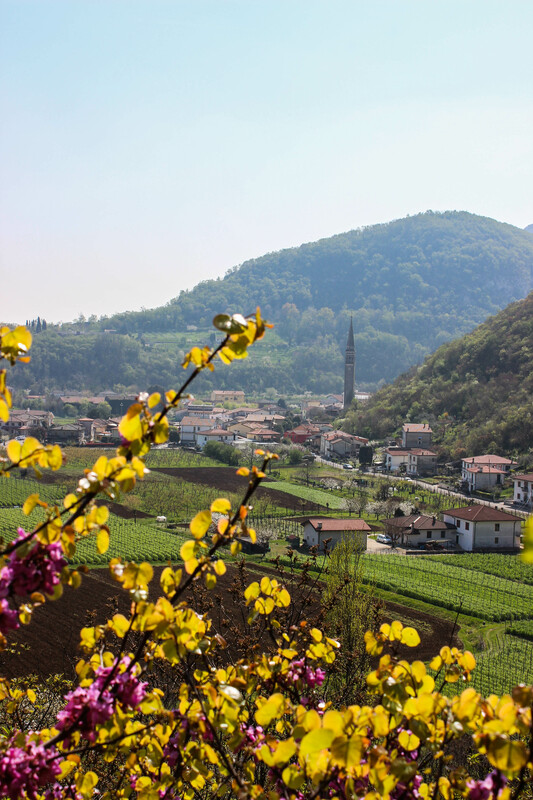 A bunch of us decided that hey – we’re in Italy! 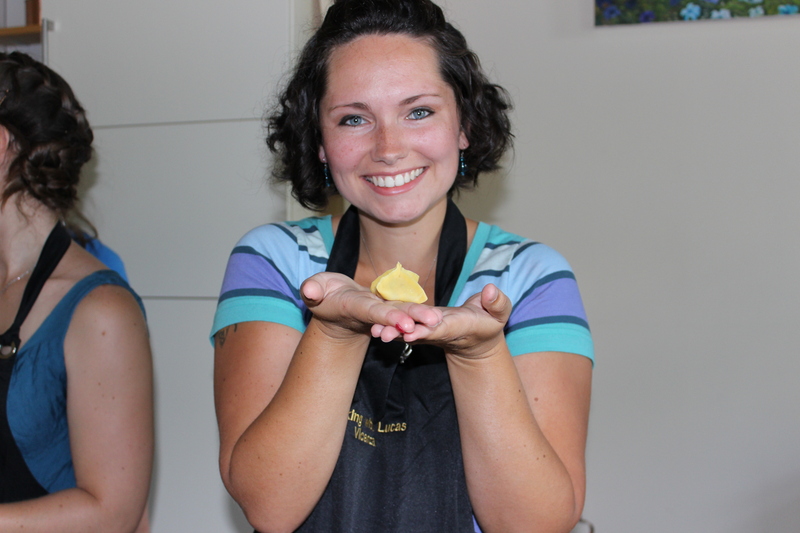 It’s time to learn to make pasta. 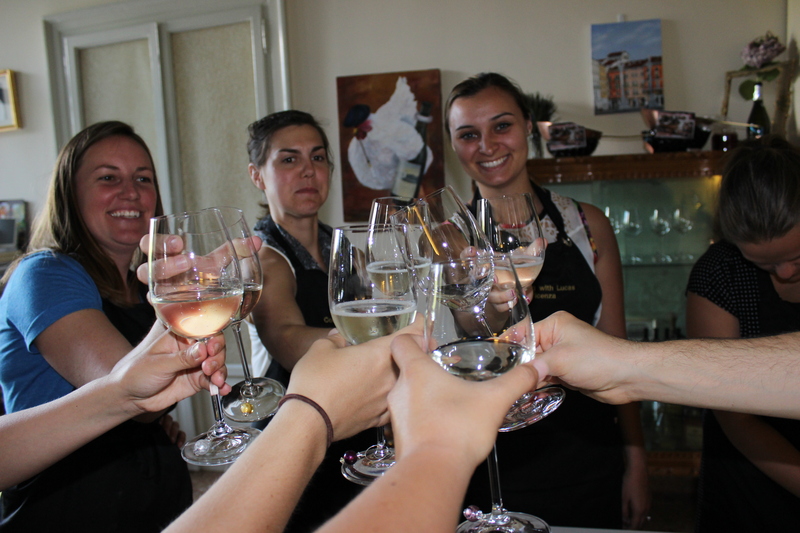 So Erin, Amanda, Diane, Laurel, Kristan and I got together to learn from Lucas. 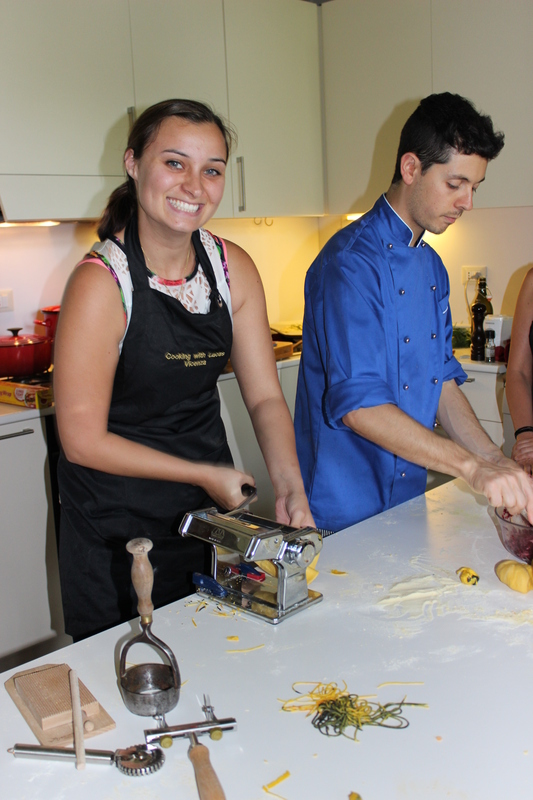 Lucas is a young chef in Vicenza and is a favorite with the Americans because of his cooking classes (and the fact that he speaks English is a bonus too). We started by preparing some sauces. 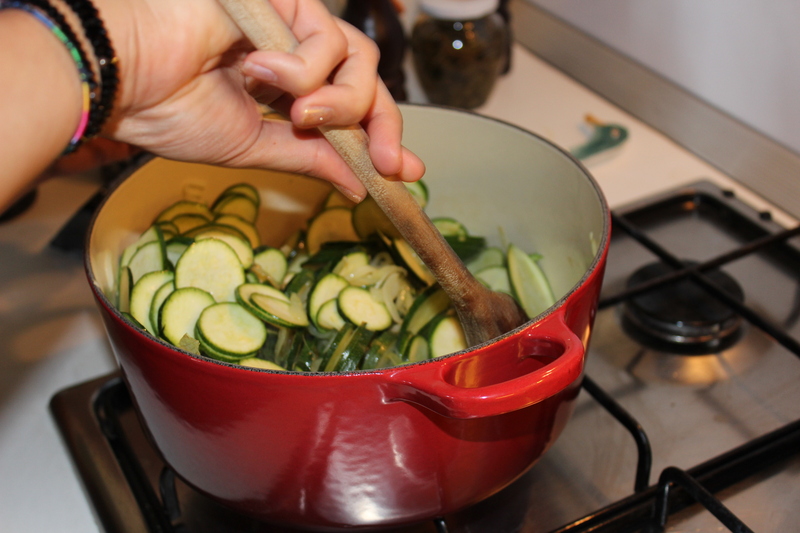 One consisted of onions and zucchini simmered in olive oil and white wine. 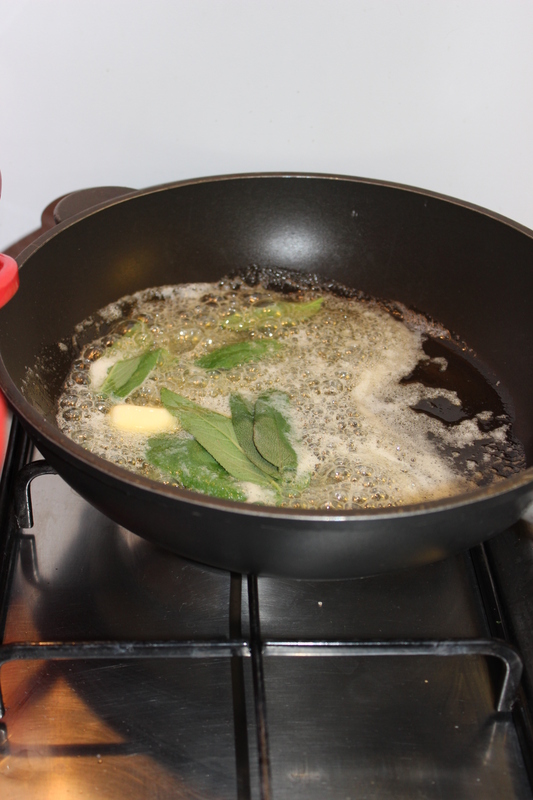 Another was a simple butter and sage sauce. 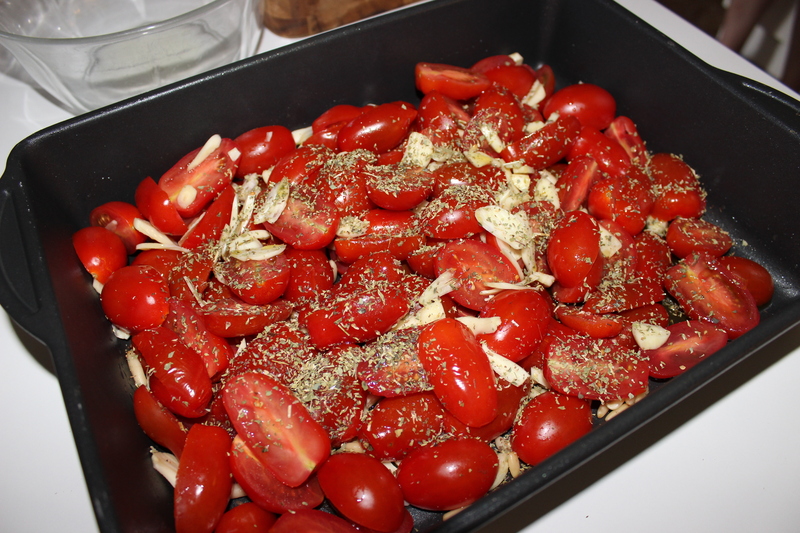 And the last was my favorite – halved cherry tomatoes, basil leaves, and sliced garlic roasted in the oven with a healthy dose of oil and some oregano. They were all so easy and delicious! Next, in preparing to make the pasta, we discussed flour. Here in Italy there are dozens of types of flour, and if you’re Italian, this matters a lot. Personally, I probably wouldn’t be able to tell the difference. 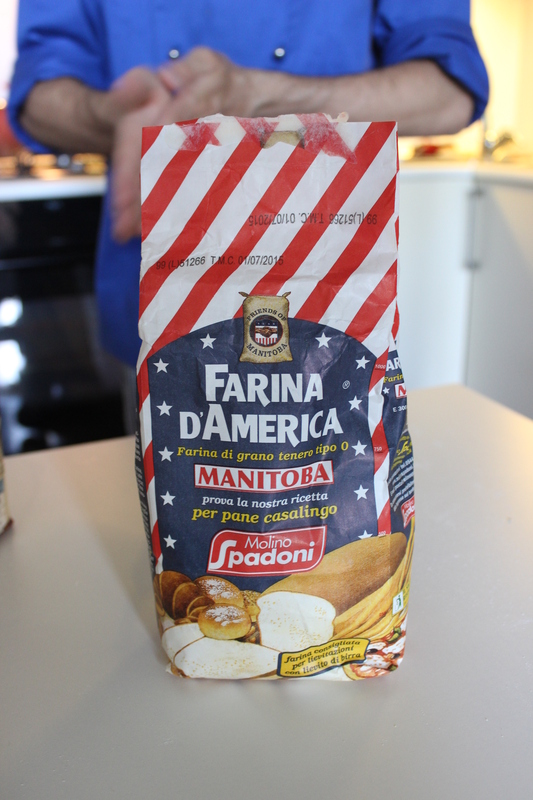 However, Lucas did tell us that Italy imports it’s bread flour from the U.S. because apparently we make the best bread flour. Cake flour is another story – if you’re baking a cake, buy Italian. 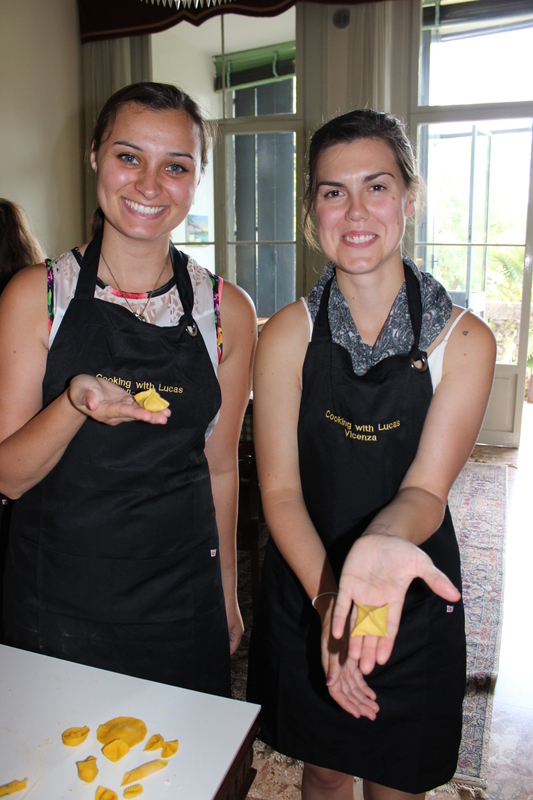 Finally we moved on to making the pasta dough. It’s EASY. Flour and egg. That’s it. Lucas eyeballed the flour (I’d say it was about a cup to a cup and a half) and had us make little craters where we could crack our eggs and mix them into the flour with a fork. You could just as easily do this in a tidy mixing bowl, but the effect of having little flour-and-egg volcanoes was kind of fun. Some of us got special additions to our dough; I got squid ink to make nice black pasta. Other people got dill, lemon zest, or pepper and paprika for a spicy, orange-colored pasta. The possibilities are pretty much endless, so you might as well have fun with it. Lucas recommended basil pasta. So how do you know if your dough is ready? You want it to be the consistency of play dough, and not too sticky. If it sticks to your hands or the table then add a little more flour. 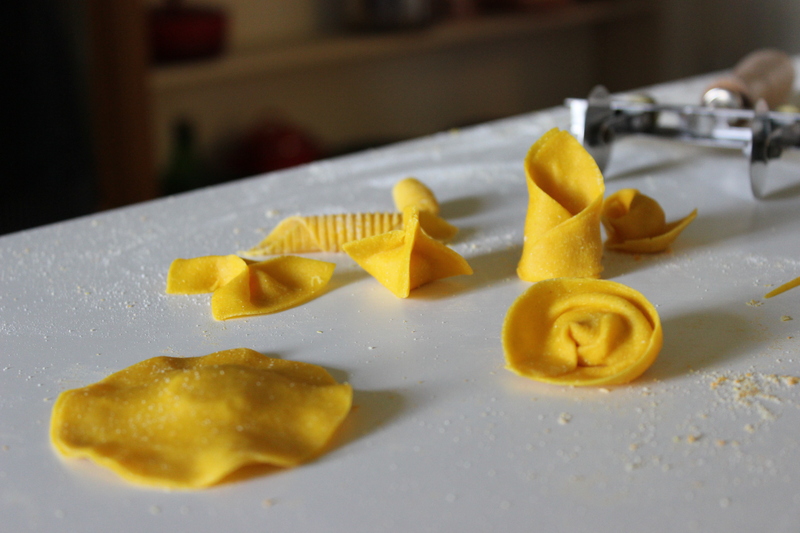 If you’re making a filled pasta, it’s ok to leave it a tiny bit stickier so it’s more pliable. If you’re making spaghetti or other noodles, you can add more flour to make it a little drier. You’ll need a pasta maker to flatten the dough. It’s pretty fun…. Just turn the number up by one each time you crank the dough through. The numbers range from 0 (thickest) to 9 (thinnest). 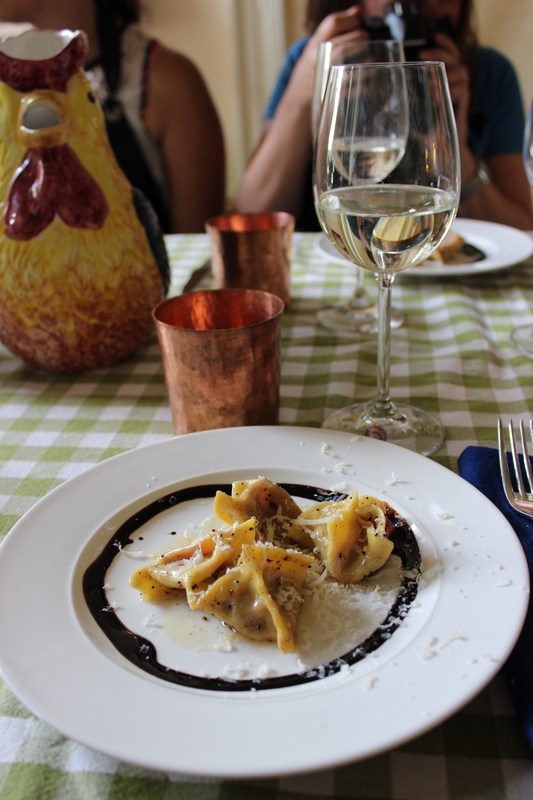 Number 7 seemed to be our thickness of choice for filled pastas (ravioli, fagottini, tortellini, etc.) and 5 was better for spaghetti. To make a filled pasta, the easiest thing to do is make a square, plop some cheese or beets or what-have-you in the center, and fold it. The best thing I can suggest is to look up different folding techniques for different pastas, because trying to describe it here just isn’t gonna work. My favorite was the beet-stuffed fagottini (served with the butter sage sauce). It’s an awful name, but delicious pasta and fun to make. Once you have your dough square and your filling, all you have to do is fold all the corners into the middle and pinch the sides closed. Yum. 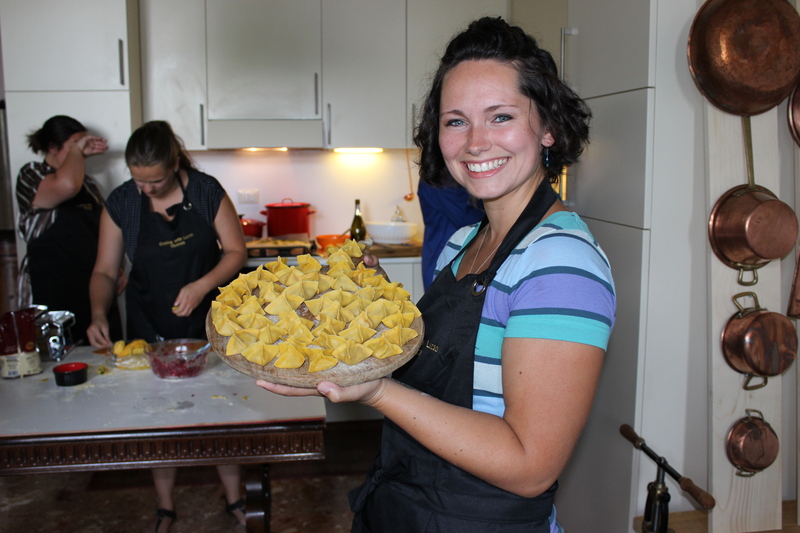 We also made some tortelloni, but that was kind of a pain to fold so I won’t elaborate. If you want to know how to make it, I’m sure there are some fantastic tutorials on youtube. The spaghetti was too easy – just feed it through the spaghetti maker on your pasta machine and throw some semolina/flour on it so the strands won’t stick together before you cook them. Cooking this fresh pasta is a very quick ordeal. If your water is boiling, it might take less than 5 minutes. If you make your pasta and let it dry first it’ll take longer of course. 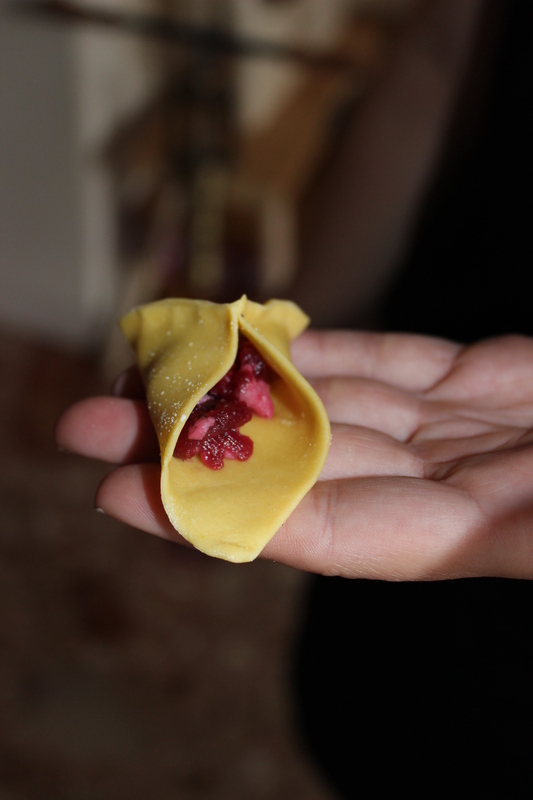 Even if you don’t like beets, I highly recommend trying a beet-filled pasta. It was so, so good, especially with the butter sauce and paired with prosecco. SUCH YUM. 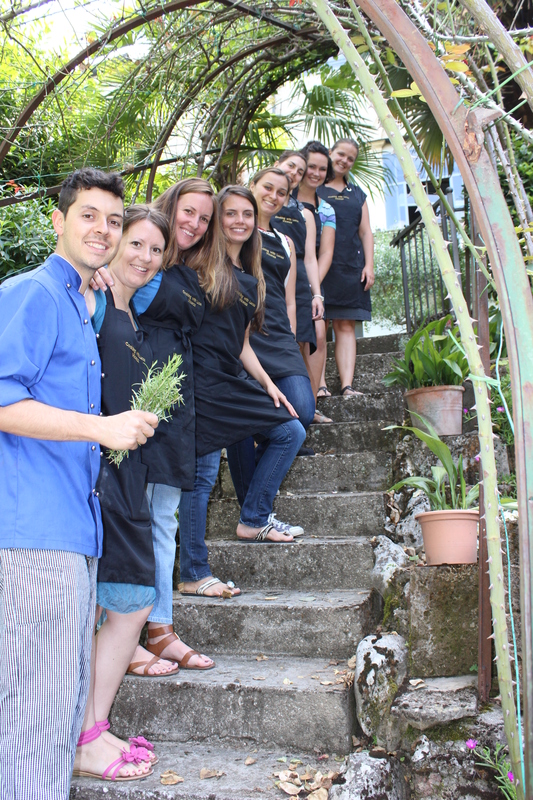 If you want to try a cooking class with Lucas, you can find his website at www.cookingwithlucas.com or you can check out his Facebook page. 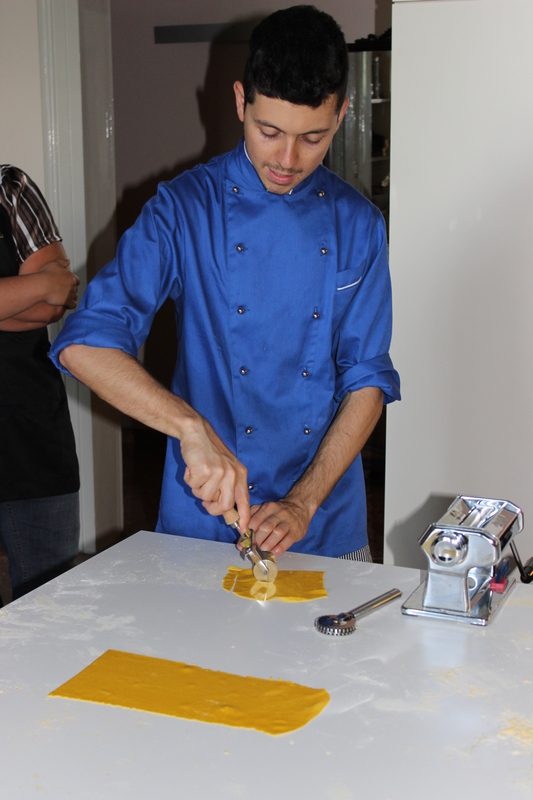 He offers lots of different types of classes, not just pasta, so you’re bound to find something you want to try out. The cost of most of his classes is €35, which I find a little expensive. But once in a while it’s worth it, especially if you’re doing the class with friends and having a great time. 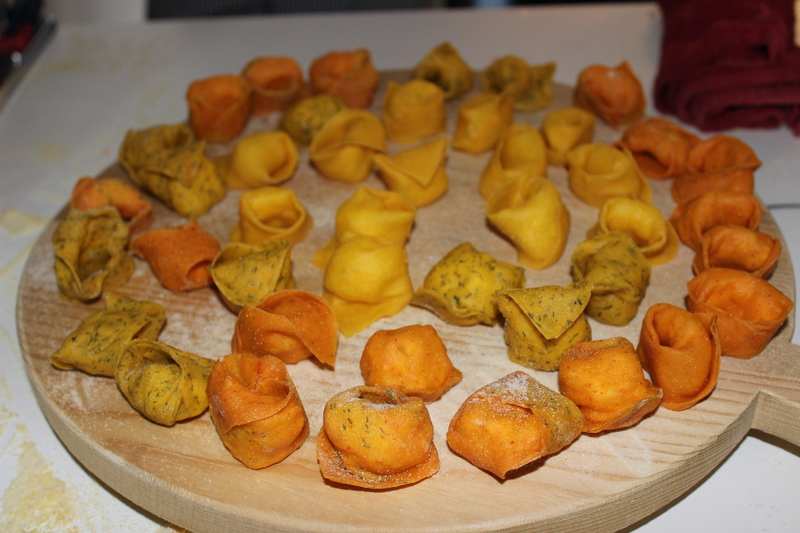 This entry was posted in Fooding, Italy and tagged cooking, delicious, fresh, Italian, Italy, pasta, yummy. Bookmark the permalink.